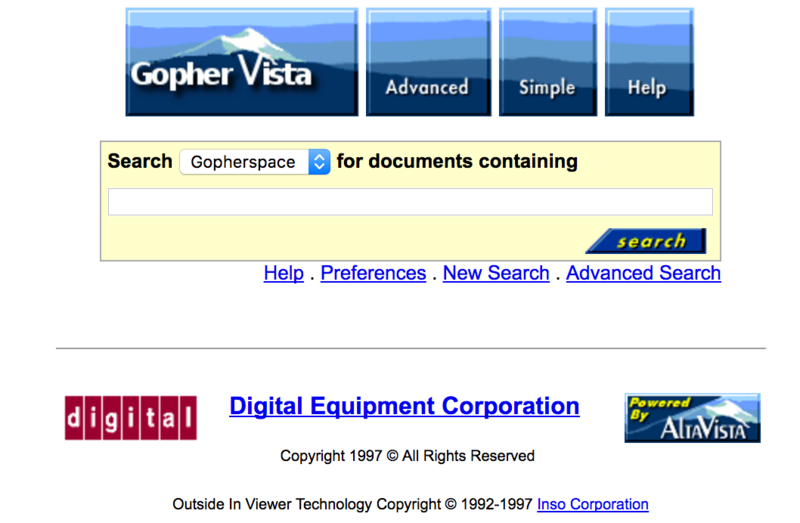 Continuing with our gopher madness, next up we have GopherVista. And this is everything I had hoped it would be when I first learned about this project. I had joked to another friend that it’d be cool to crawl and feed the indexer data in a manner that could basically bring AltaVista back to life. And we laughed, and I had my utzoo search and that was that. However, across the internet, Ben didn’t hear any naysay about limitations or anything to get in the way, and went ahead and wrote a crawler in go, kept the results in a sane name/db order for later sanitisation in and out of AltaVista, and after an aggressive gopher port scan of the internet, he created GopherVista, an index of the gopher-verse, running on Windows 98. 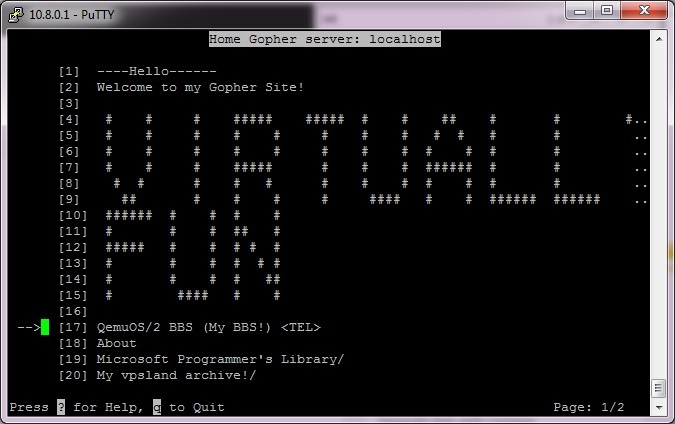 No, really, you read that right, GopherVista backends on Windows 98! Read all about the creation of GopherVista over a Ben’s blog blog.benjojo.co.uk. 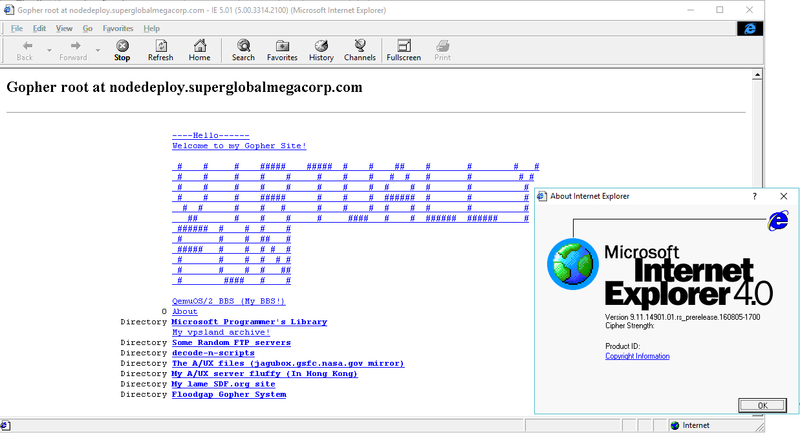 Keep in mind that this is a search engine, not a proxy, so it’s best to use something like Internet Explorer 4, or an ancient Netscape that supports both HTTP 1.1 & Gopher. I have to also say, that something like this is far more cooler, and better thought out than my utzoo hack, and I’m just happy to have inspired him, but now I really want to re-think my setup, and of course index all the things…. Thanks to reader Peter Godiwn, he built a .net Gopher Proxy that can read several providers via API, and to get the ball rolling, he built a WordPress connector, and yes it works great with my site! Naturally that URL won’t work for 99.99% of the people out there since their browsers don’t support gopher, but the Floodgap Gopher proxy, will do the trick! One cool feature is that it can take modern images, and convert them to GIF for older browsers. Images even work on Netscape! You can find source & binaries on his github page. Super thanks to Peter, and what a fitting 10+1 post! Back when Minnesota was at the centre of the online world. Then it wasn’t. It was nearly 2 years ago since I last played around with Gopher.